The Technical Health Careers program offers students the time and opportunity to explore various careers within the healthcare industry. The program provides the information students need in order to make informed decisions regarding the health care paths they wish to follow and includes coursework on such topics as anatomy and physiology, first aid and advanced life support, patient care and communication, medical terminology, safety, as well as fundamental healthcare competencies. 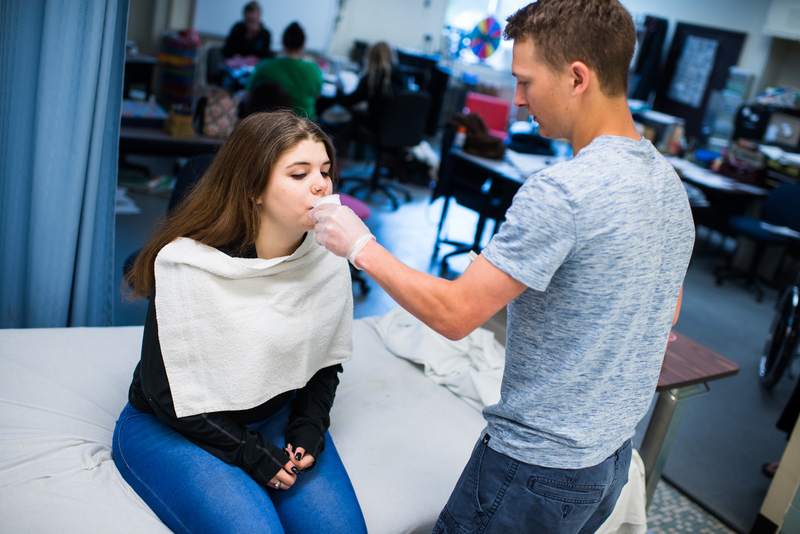 Graduates are prepared to enter a two- or four-year college program and are equally prepared for entry level into a variety of healthcare workforce positions after high school. The program offers Medical Terminology for three college credits thru River Valley Community College. Students will also complete training to earn their Licensed Nursing Assistant (LNA) certification, as well as First Aid and CPR. Students are also strongly encouraged to participate in college-level dual-enrollment courses at CCV or VTC. Past students have attended Castleton State University, Lyndon State College, University of Vermont, Norwich University, University of Southern Maine, Vermont Technical College, and Community College of Vermont. Students applying to the Technical Health Careers program should possess a strong interest in providing service and health care to a wide range of populations; a commitment to mastering the ongoing challenges of academic and clinical skill development; a willingness to obtain additional academic support if needed; and a desire to take academic and personal initiative. Students should have a dedicated, positive, caring, and encouraging attitude.